Tobacco control leaders were extremely proud of the movement's achievements in the state of Minnesota. In sharing their perspectives and experiences with Mark Wolfson, they found a way of making sure that the story would get told. His training in social movements had given him an appreciation of the importance of understanding the social infrastructure on which movements are built, and Minnesota had built heavily on the infrastructure of health care and public health. What became apparent is that the struggle against the tobacco industry in Minnesota involved a close, collaborative relationship between government (or "state") actors and the leaders of the tobacco control movement. 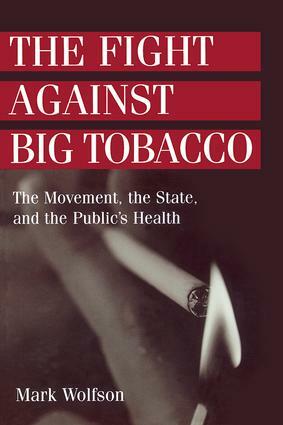 Wolfson develops both of these themes: building on the infrastructure of health, and state-movement interpenetration, to understand the emergence, growth, and outcomes of the tobacco control movement in Minnesota. He focuses on the advantages and constraints associated with these two related themes. He goes beyond the case study method to assess the generalizability of the pattern, and whether the same sort of movement can be used by other states in North America, and even in other countries and their social movements. How has the tobacco control movement become such a significant and successful force in shaping public policy, social norms, and the habits of millions of Americans? In this first such detailed study by a sociologist, Wolfson documents how the movement has grown over nearly three decades by building an infrastructure of health organizations and health professionals, and by fostering relationships with government. Rich in survey data, extensive interviews, and archival sources, this text is essential reading for courses in social problems, social movements, and public health. The general reader will also find it engaging, given the issues of tobacco use as an addiction and a social problem.